Here is the moment of truth … Smokers should be aware about the undeniable truth that besides the irreparable damage they are causing to their lungs, they are also inflicting equal damage to their bones especially the back bone as well. For those in the process of laughing it out loud, a few medically proven facts is sure to add a couple of furrows to the forehead. To begin with, studies have shown that nicotine tends to slow down the production of osteoblasts or, bone forming cells thus, thinning the density of the skeletal system. As a result, the bones including the backbone become weaker over a very small period of time, making them more prone to injuries and resultant pain. Secondly, it has also been shown through numerous studies conducted by medical experts that smoking decreases absorption of calcium from the daily diet. This increases fragility of the bones to the extent of causing osteoporosis. 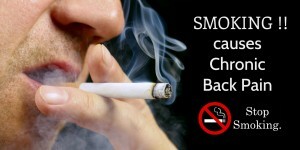 Thirdly, smoking reduces oxygen supply as much to the bones as to the rest of the body. The consequences are obvious. So the fact that non smokers report less back pain should be considered with all due respect by the smokers, because this happens to be the ‘truth’. Giving up on nicotine and reintroducing oneself to healthier options of living is something that should be put into effect as soon as possible.